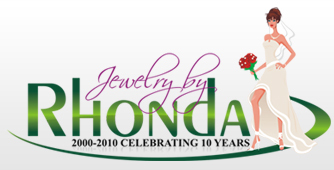 Jewelry by Rhonda - Sterling Silver Wedding Day Good Luck For the Bride and Groom Wedding Cake Charms! Brides, there are lots of good luck symbols for your wedding day - read more on our Wedding Traditions, Customs, Symbolisms and Superstitions pages. This page is full of good luck charms for your wedding day - the way I see it....it is better to have a good luck spider charm rather than find a spider in your wedding gown! Brides, put your good luck charm in your wedding bouquet. You can let the satin ribbon cascade out of your bouquet. Grooms, pin your good luck charm on your boutonnière (or put it in your tuxedo pocket near your boutonnière). Brides, you can sew or pin your good luck charm into the hem of your gown - this is a great idea for the spider or horseshoe charm. Brides, you can slip your charm in your shoe - this is a great idea for the lucky penny charm. After the wedding, take your charms and place them on a sterling silver charm bracelet or put them in a very special place for safe-keeping. 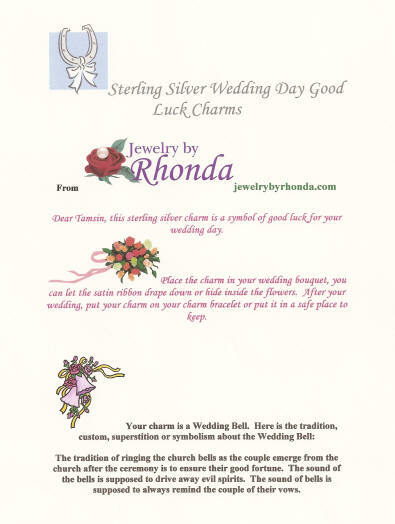 Your order will come with a Description Card describing the Wedding Day Good Luck tradition/custom/folklore/superstition symbolized by each sterling silver charm.